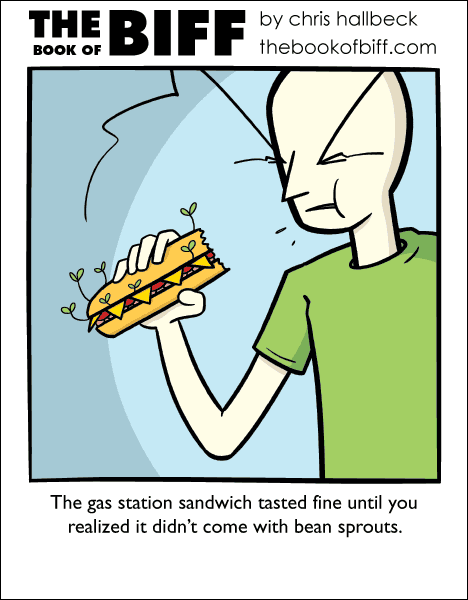 Yeah… I work in one of those gas stations, and we have sandwiches like that… I don’t trust them even a week after they’ve been there, and we will sometimes have some that have been there for a month. There’s a reason I eat very little that originates from my place of work. There are sandwich trucks just like that in Sweden. Mom told me this, and she worked at a gas station for 10 years or so. The salad in the sandwiches was sometimes brown. Yecch! Sandwich from a Men’s Room? All of a sudden that Subway inside the nearby Shell seems very suspicious. Remember that spinach yoghurt a while back?